Scrolling through social media you can’t help but happen upon the latest poll or survey into what country is the best to live in. Up at the top of these lists, or thereabouts, is the nation of Denmark. Danes are happy people. They have some of the longest, darkest winters, some horrendous weather and ridiculously high taxes – so why are they so chipper all the time? The answer lies in Hygge. Hygge (pronounced hue- gah) isn’t so much an adjective as it is a way of life. It is a philosophy that grounds itself in being ‘in the moment’ and removing yourself from the rushes of everyday life, enjoying the here and now. It can be snuggling under a warm blanket with a good book, putting an extra marshmallow in your hot chocolate or having dinner by candlelight. Everybody will have their own recipe for Hygge, they will have their own special ingredients to add into life. So is there a Scottish equivalent? We have racked our brains and the closest word we use is “cosy”. Being outside during a winter in the Highlands of Scotland can be a truly remarkable time. There is nothing quite like a crisp, cold day for exploring the beautiful wilderness that we have in abundance. After a day outside you can truly appreciate a warm welcome and cosy atmosphere. Sometimes you have to go outdoors to appreciate the warm return. 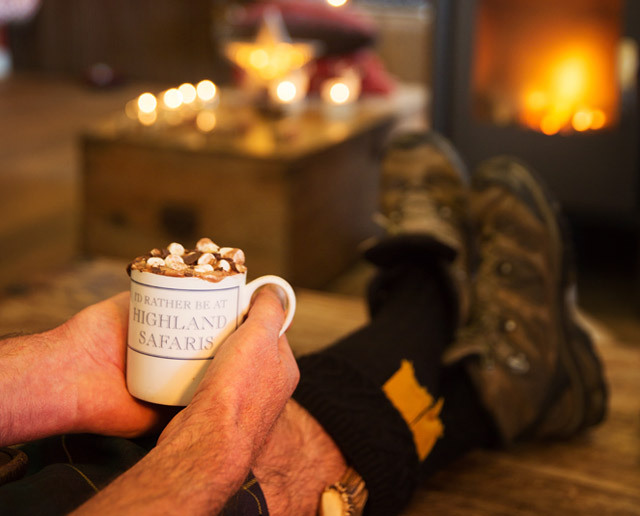 At Highland Safaris we pride ourselves in this and Hygge/ cosiness very much plays a part in everything we do. The fire is always burning, the candles are lit and there are warm blankets a plenty. Nothing beats a warm mug of coffee and slice of home-made chocolate cake whilst you reminisce over your adventure with friends and family on a comfy sofa. Relax and indulge, laugh and be merry. We would very much like to share our cosy/ Hygge atmosphere with you and hopefully we can give the Danes a run for their money in the happiness stakes!